We were originally planning to ride the new FrontRunner train to Salt Lake on the free train day, but like all free Utah things, it was super crazy and packed. So with the evening's plans ruined, we drove back towards home on University, when I noticed that the sign was turned on for the Wild Mustang. I'd seen it before and knew it was a new restaurant, so with last-minute decisiveness, we decided to pull into the parking lot! When we arrived, there was a little bit of a wait, and the hostess kept mentioning how she was surprised at how full the restaurant was. We were seated, and then proceeded to wait a good fifteen minutes until our server arrived. When she finally did come around and ask if we wanted drinks, we were each given one of these sad looking rolls. I had thought that this restaurant was going to be similar to Texas Roadhouse (with hopefully shorter lines! 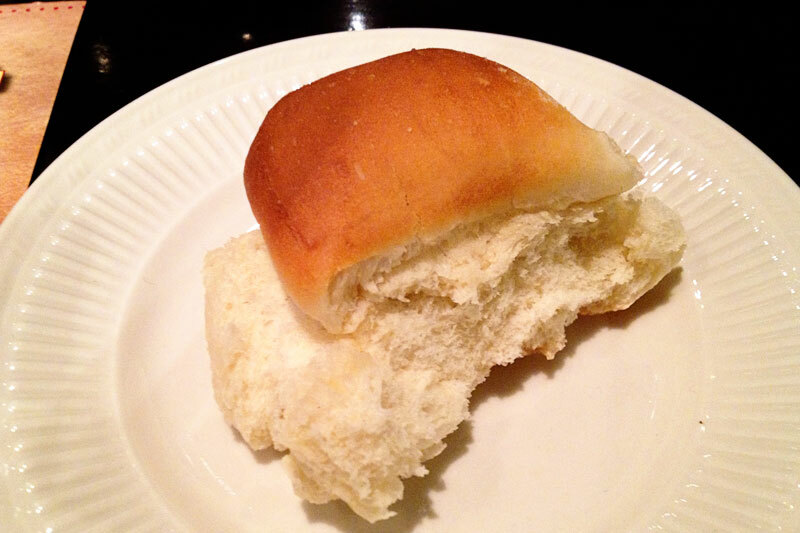 ), and they did give us some honey butter, but I was just so put out by this poor little roll. 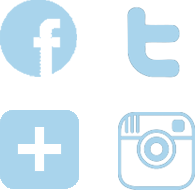 So ugly, so haphazard. After taking our order, she gave back in another 15 minutes and brought this basket of rolls -- much better! A whole basket, beautifully shaped, and much prettier! 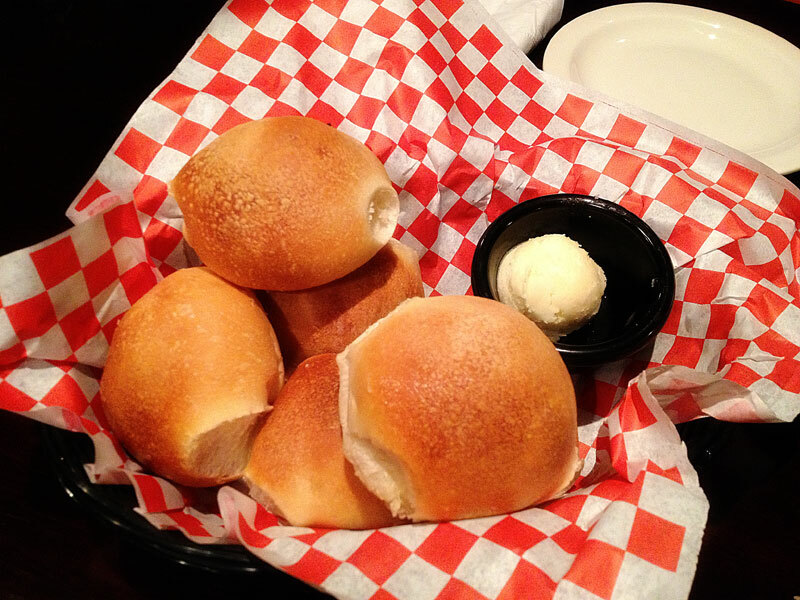 The honey butter was soft and spreadable on the warm rolls, and my hopes were lifted again. 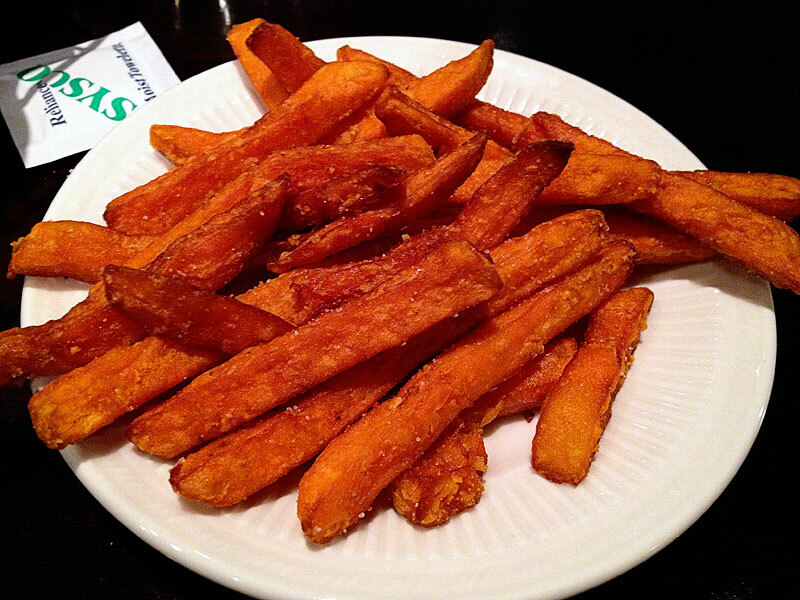 My first side option didn't arrive with the meal because they were all out (the soup of the day), so I decided to try the sweet potato fries. Of course it took another ten minutes for them to arrive, but they were pretty good. They were out of ketchup, so I went with ranch - a viable option. 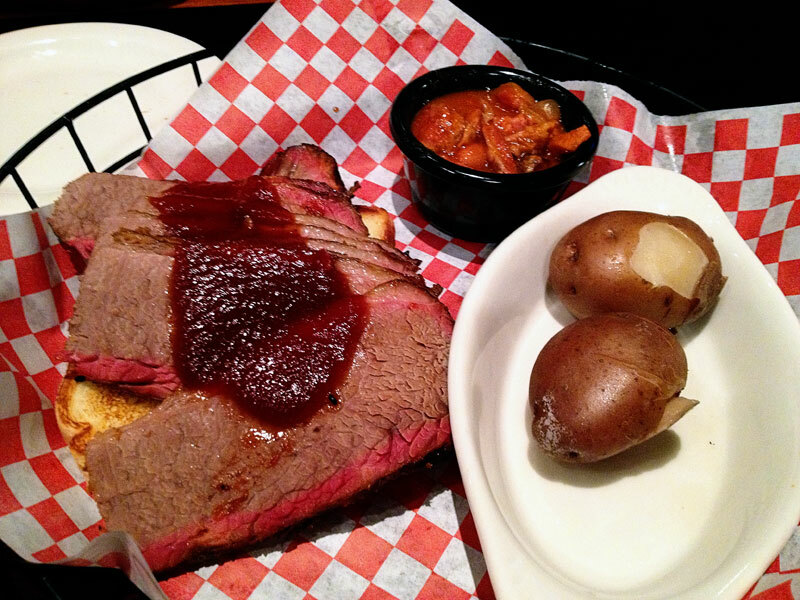 Owen ordered the beef brisket, which was served on a slice of country toast. We thought the toast was a little weird, but it ended up being pretty good if you ate the meat on top! The brisket was a little drier than we had hoped, but was still overall fairly tasty. We had to laugh at the side of "new potatoes," which were literally just two baked red potatoes, completely plain. When our server asked if he wanted butter with the potatoes, we said yes, and were brought another little container of the honey butter. I'm not sure if this was on purpose, but the honey butter on the potatoes was a little weird (but not horrible). The side of baked beans was the smallest portion of baked beans I've ever seen, and they were definitely unique - full of meat chunks and different types of beans. They weren't our favorite baked beans ever, but they weren't bad. 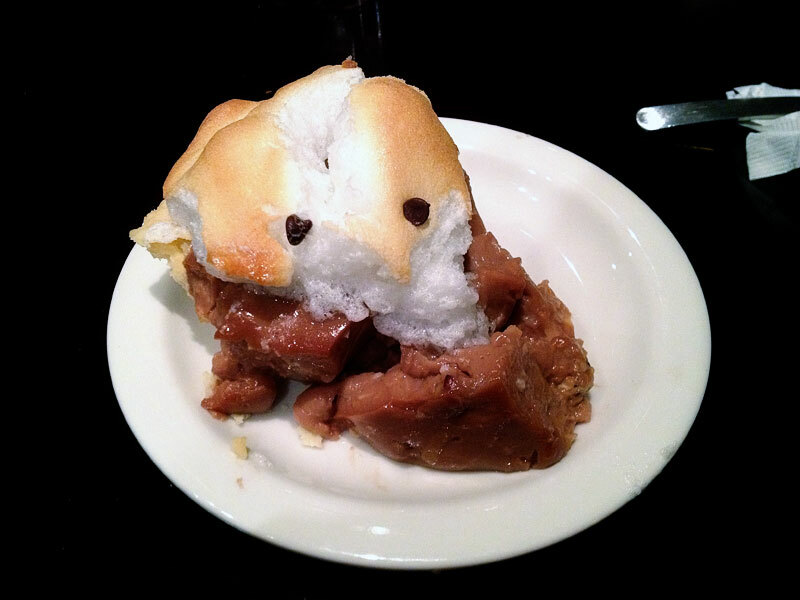 We decided to go for a piece of chocolate meringue pie, and she ended up bring us out two! It wasn't the prettiest pie, but it had pretty good flavor. I especially liked the meringue and thick buttery crust. When we asked for the check, she told us that everything was on the house because tonight was the Friends & Family soft opening event! We were totally surprised and honestly awkward, but that totally explained our "complaints" about any service or lacking menu items! They didn't even have their registers up and running yet, and they were super busy (if you're going to have a lit-up sign on University on a Saturday night, people are going to come in!) with probably a not-full staff, so I completely forgive them of all service issues we had! Not to mention -- free food! Yeah, we totally lucked out on this one...! What You Should Do: I would definitely recommend checking out Wild Mustang...now that they are open for real! 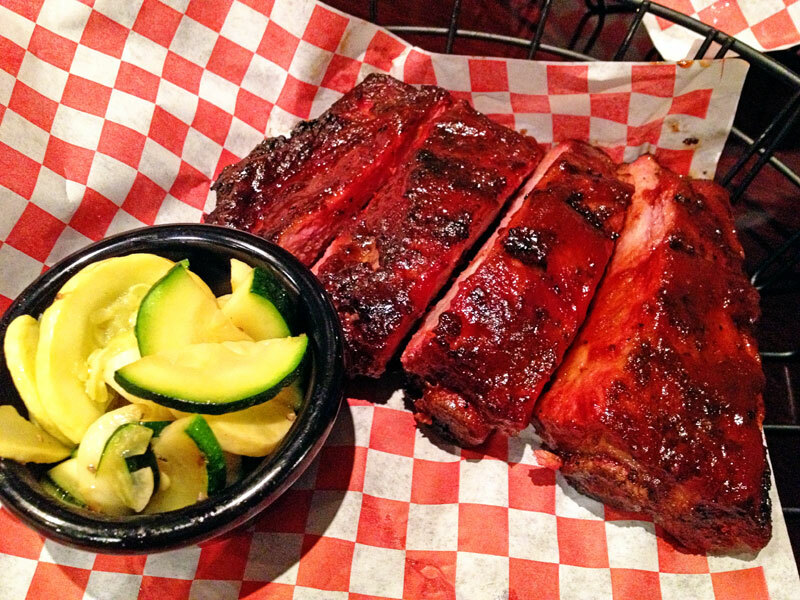 Wild Mustang is like a less busy Texas Roadhouse, with better ribs! Though they were quite slow, I really can't blame them, and the service was still all very friendly. As far as the food presentation and side dish size complaints go - I'm sure they were also due to the soft opening craziness, so all in all, pretty good! We hope to be able to visit again some time when they have been up and running for a while! I'd love to drive my car right there (my Mustang, nonetheless) at any given day if I get to see and eat these fantastic-looking dishes. Yum! Ah, bummer! 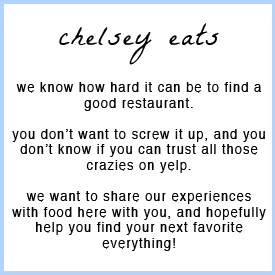 We went during their preview so maybe the food was different...we will have to go back and do another review!